Today we chat with Chris Boynton, who is the editor at one of our sister sites – VikingsGab.com – about the 0-3 Vikings, this Sunday in London, and his prediction for the game vs the Steelers. 1. The Vikings went to London a few days earlier than the Steelers – do you think that will give them the advantage being able to get use to the surroundings earlier? Vikings Gab – I’m not so sure that getting to London early is an advantage for Minnesota. The Vikings have spent several days away from home while the Steelers slept in their own beds. I’m not a big believer in the whole getting used to the surroundings thing. When I played ball and we were on the road, I never felt that I needed to get acclimated. I just wanted to get through it and get back home. I think that every day that you have to eat in restaurants, catch a cab wherever you go, and sleep in a hotel saps your strength, and wears you out mentally. That’s one of the reasons it’s so hard to win on the road. It’s not just the cheering crowd, it’s stress and boredom and loneliness. 2. Grade QB Christian Ponder through the first three games – is he on a short leash if he doesn’t play well Sunday? VG – I cannot really get a read on what coach Frazier is thinking concerning the performance of Christian Ponder. What I will say, however is that while Ponder has turned the ball over more then I am comfortable with, I think it’s only fair to point out that the Vikings are currently 7th in the NFL in points scored, and well ahead of last season. I understand that Viking fans are frustrated with the 0-3 start, the issues are much deeper then just the QB play. If the defense makes a late stop in both games 1 & 2 then the team is 2-1 and we are touting the play of the offense. It’s difficult to win when you surrender 34, 31 and another 31 points to a team that had scored only 1 offensive touchdown in it’s first 2 games. That’s NOT on Ponder. 3. Adrian Peterson has gotten off to a slow start – is that more on him, opposing defenses, or the Vikings O-line? VG – I am not worried about Adrian Peterson’s production at this point as he is actually ahead of last season’s pace when he finished with over 2,000 yards. Last year through game # 3 he had rushed for 230 yards, but this season he has 281 yards at the same point. My frustration so far is with the offensive line as they have underperformed from what we saw last season. Already we have seen Christian Ponder besieged by the opponents pass rush. He has had very little time to set up in the pocket without someone applying pressure on nearly every play. This is when he has forced the ball and thrown careless interceptions. As a note, on those rare occasions when he has had time, he has showed poise and accuracy. 4. Last week Browns QB Brian Hoyer seemed to have success throwing the ball against the Vikings secondary, is the secondary the weak point of this team right now? VG – The secondary has certainly struggled (with the exception of safety Harrison Smith and cornerback Xavier Rhodes) and the recent injuries haven’t helped. Chris Cook has been solid when healthy, but has only played in about 1/2 of the teams total games over the last 3 years missing 10 games his rookie year, 10 games in his second year and 6 games last year, so he simply cannot be counted upon. Rhodes is the real deal (have you noticed that his name is rarely mentioned ? That means he’s doing his job !). A.J. Jefferson (ankle) Jamarca Sanford along with Chris Cook (groin)had MRI’s this week and are questionable for the Steeler game. Marcus Sherels had a very good game last Sunday and graded out as their best cover player vs. the Browns. This group made QB Brian Hoyer look like Joe Montana at times although the defense did manage 4 interceptions. The overall play of the defense has been mostly unacceptable, however I think the blame can be placed on the defensive line for providing very little pass rush from the front four. When they have placed pressure on opposing QB’s, it’s been because the linebackers and in particular MLB Erin Henderson have stepped up. But blitzing LB’s mean single coverage for the secondary and Hoyer took advantage of that. 5. Who do you think wins this game – and why? VG – Tough call, I may change my mind by game time. The Steelers are struggling on defense, and if given time I think Ponder will have success as long as he doesn’t force the ball. Peterson will be Peterson and I look for him to stop trying to score on every play and simply hit the hole and hit it hard and often. 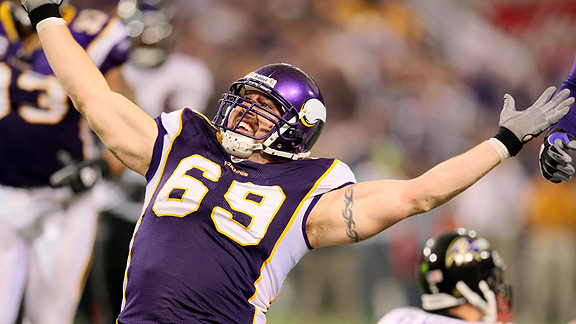 Hopefully, we will get a more consistent effort from Jared Allen and the front four without having to blitz. I’m looking for the corners to step up and play more physically off the line and if there is a strong pass rush, then they should be able to force some turnovers. If not, then the secondary will give up some big plays unless the safeties play out of their minds. I’ll go out on a limb and say the Vikings win – 24 – 16. Video: Who Is The Biggest Blame In Sunday’s Steelers Loss? Be the first to comment on "Five Questions With Vikings Gab Editor Chris Boynton On This Sunday"